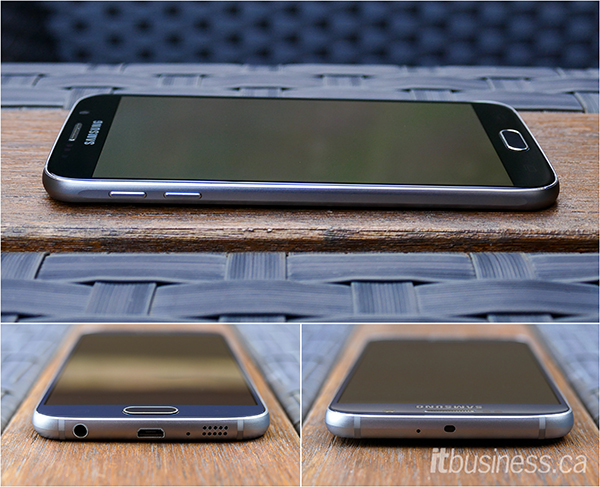 When we reviewed the Samsung Galaxy S5 last year, we thought it was a very good smartphone for business users. However, its design was a little lacklustre, unadventurous you might say, and not too different than its predecessor. Consequently, as good as it was, the S5 didn’t set the world on fire, and sales were much lower than Samsung expected. Because of this, Samsung has gone back to the drawing board with its latest phone, the S5’s successor, the Galaxy S6. 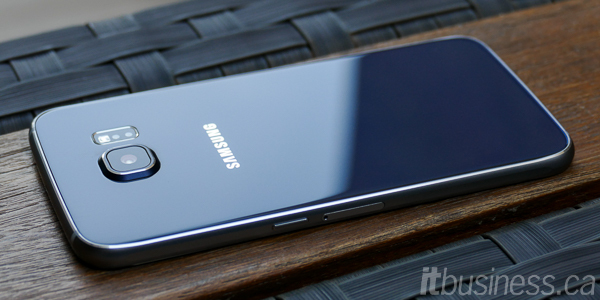 After experimenting with metal and plastic construction in last year’s Galaxy Note 4 and Galaxy Alpha (click the links for the reviews), Samsung has gone even further with the S6. This year’s flagship phone ditches plastic almost entirely, being made of glass and metal, and looks a lot more premium than any Samsung phone before. 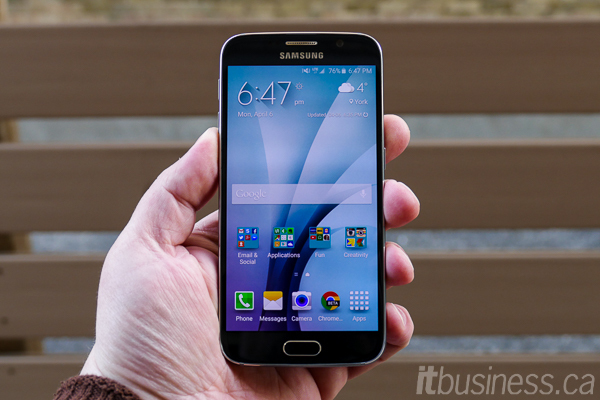 The Galaxy S6 goes on sale Friday at nearly every Canadian carrier. Read on to see if it’s worth putting down your money for. Build Materials & Colour Metal frame and Gorilla Glass 4. Availability & Pricing Bell, Eastlink, Fido, Koodo, MTS, Rogers, SaskTel, Telus, Wind Mobile, Videotron and Virgin Mobile. Starting at $250 on a 2-year term, $750 outright. The Galaxy S6 is the best looking phone that Samsung has ever made. Its metal and Gorilla Glass 4 construction is a big step up from the plastics of previous models, and its impeccable build quality matches that of Apple and HTC phones. Like the Galaxy S5, the S6 is also one of the most compact of the current crop of flagship phones, but still manages to incorporate a 5.1-inch screen. Its size, solid construction, weight, and balance makes it very comfortable to hold and use. The S6’s QHD Super AMOLED screen is gorgeous and is probably the best smartphone display we’ve ever seen. It is incredibly crisp with a PPI of 577, which makes it the sharpest phone display on the market. It is also very bright – we measured its maximum output as 550 nits. This means it is viewable even under the brightest sunlight. Internally, the Galaxy S6 is powered by a 64-bit Octo-core Samsung Exynos 7420 SoC (system on a chip). This chip has four 2.1 GHx Cortex-A57 cores for demanding tasks and four less-powerful (and, therefore, more power-efficient) 1.5 GHz Cortex A-53 cores for lighter workloads. The S6 also uses faster UFS 2.0 memory for its storage. It is a lot faster than MicroSD storage, which explains the absence of a MicroSD slot on the S6. As you can see from the numbers below, the S6 handily outperforms the competition. The fingerprint scanner found in the home button has been upgraded and now works like the iPhone. Instead of swiping across it like you had to do on the Galaxy S5 and Note 4 you now simply hold your finger on it for a second. It reads your fingerprint almost instantly, and it can be used to authenticate you when logging in and with the upcoming Samsung Pay mobile payment solution that the S6 supports. The S6 has CAT-6 LTE connectivity and on Bell’s network we were able to achieve some blazingly fast download speeds – up to 157 Mbps. On the power side of things, the S6 supports both kinds of wireless charging, Qi and PMA and, when using the included charger, you can also fast charge the battery. You get four hours of use from a 10 minute charge and can fully-charge the phone in just over an hour. 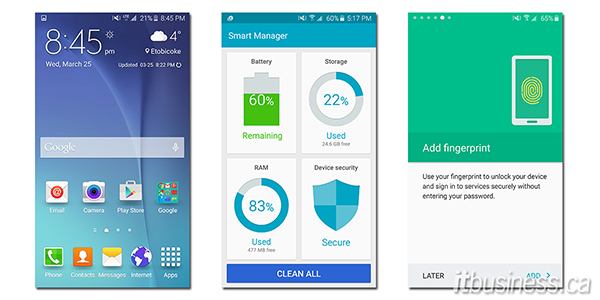 The Galaxy S6 runs Android Lollipop 5.0.2 overlaid with its TouchWiz launcher. Much maligned in the past for being bloated and slow, this latest version of TouchWiz has been improved and streamlined to the point of being just as smooth and fast as stock Android. Samsung has also wisely scaled back the amount of pre-installed Samsung applications to just the essentials. The S6 supports Samsung’s Knox enterprise-grade security and management features and also has built-in McAfee powered anti-malware. The camera uses the same excellent 16MP Sony Exmor RS sensor with OIS (optical image stabilization) as the Galaxy Note 4, but with an upgraded f/1.9 wider- aperture lens. This means low-light performance has been improved, and close-up photographs now have attractive SLR-like unfocused bokeh in their backgrounds. The S6’s camera interface also has a new ‘Pro’ mode that allows you to manually control focus, ISO, exposure and white-balance. 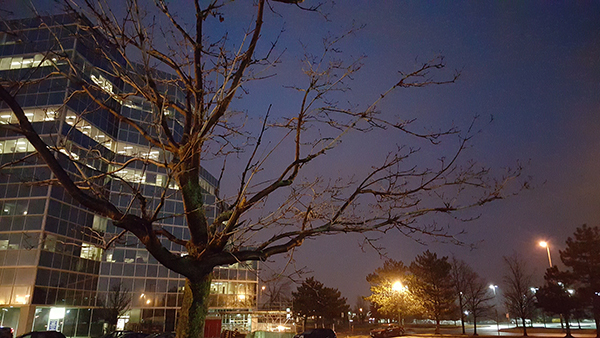 Overall, the S6’s camera is hands down the best we’ve used on any smartphone. It’s super-fast to start and focus, it has great low-light performance, an easy to use UI and its auto-mode takes excellent photographs every time, no matter the shooting conditions. While the lack of a microSD slot and removable battery can be viewed as a step back from its predecessor, the first is offset by the fact that even the base-model now comes with 32 GB of faster UFS storage. However, the change to a fixed battery is an issue, simply because the S6’s battery life isn’t the greatest. Due to the combination of a more powerful SoC, higher-resolution screen, and a lower-capacity battery, the S6 was only able to last for 12.3 hours. That’s a significant drop from the S5’s 18.1 hours. This means you’ll definitely have to top up the phone half-way through the day. Thankfully, the S6’s rapid charge time makes this a lot less painful, which greatly offsets this issue. TouchWiz, while much improved is still a little garish when compared to other Android skins, and it seems in its quest for simplification, Samsung took things a little too far in some areas. For example, you can no longer automatically sort applications alphabetically in the app drawer. Samsung also decided to drop the water-resistance that the S5 had – if Sony can make a metal and glass waterproof phone, so can Samsung. Lastly, the S6 still lacks stereo speakers. Overall, I think the Galaxy S6 is currently the best Android phone you can buy for both business and personal use. It’s beautifully designed, very powerful and has an amazing camera. It’s also the first Android phone that we think can go toe-to-toe with the iPhone in every category. The Galaxy S6 will be available on April 10 starting at $250 on a 2-year term from Bell, Eastlink, Fido, Koodo, MTS, Rogers, SaskTel, Telus, Wind Mobile, Videotron and Virgin Mobile. IT professional & freelance tech writer. Founder of The Art of the Gadget. PC gamer, indie comics fan & cinephile. Sometimes curmudgeon.